A major announcement for Aion is coming next month, on November 11th for Korea. Developed by NCsoft, Aion is the most visually beautiful MMORPG ever made. Though it said Aion's Korea server and English server would be coming the same time, not an exact date of Aion English server has been revealed. NCsoft recently released a new piece of artwork, hinting at the change which will be arriving. The new huge expansion of Aion KR on November will be added a variety of contents that can maximize the users' immersive experience. Most are speculating it will be version 5.0. Players will create their own distinct history and will have their names forever recorded in fame or infamy. In this ethereal world, you will have the power to direct dynamic relationships between angels, demons and dragons to control the fate of the world. Only bloodied Elyos bodies are seen. Is it the rise of the opposing Asmodian faction? It displays a group of characters with wings who died on the wood piles. How to play Aion KR when living outside of Korea? Install a VPN app, it's more convenience than manually setup VPN. Login with username "vpnu", and its latest password. If you already have a premium account, use your account. Traffic type: choose "send all tyraffic via VPN". Remember to check box "enable IPSec for L2TP" and "auto reconnect". Check your IP. 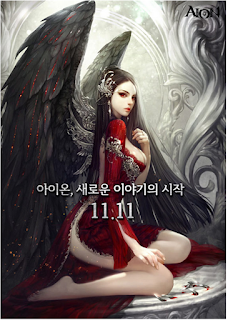 After your IP changed to Korean IP, you can play on Aion Korean server.